To boot the system without boot media, you usually need to install a boot loader. A boot loader is the first software program that runs when a computer starts. It is responsible for loading and transferring control to the operating system kernel software. The kernel, in turn, initializes the rest of the operating system. If you do not want to install GRUB as your boot loader, click Change boot loader, where you can choose not to install a boot loader at all. If you already have a boot loader that can boot Red Hat Enterprise Linux and do not want to overwrite your current boot loader, choose Do not install a boot loader by clicking on the Change boot loader button. If you choose not to install GRUB for any reason, you will not be able to boot the system directly, and you must use another boot method (such as a commercial boot loader application). Use this option only if you are sure you have another way of booting the system! Every bootable partition is listed, including partitions used by other operating systems. The partition holding the system's root file system has a Label of Red Hat Enterprise Linux (for GRUB). Other partitions may also have boot labels. To add or change the boot label for other partitions that have been detected by the installation program, click once on the partition to select it. Once selected, you can change the boot label by clicking the Edit button. Select Default beside the preferred boot partition to choose your default bootable OS. You cannot move forward in the installation unless you choose a default boot image. The Label column lists what you must enter at the boot prompt, in non-graphical boot loaders, in order to boot the desired operating system. Once you have loaded the GRUB boot screen, use the arrow keys to choose a boot label or type e for edit. You are presented with a list of items in the configuration file for the boot label you have selected. Boot loader passwords provide a security mechanism in an environment where physical access to your server is available. If you are installing a boot loader, you should create a password to protect your system. Without a boot loader password, users with access to your system can pass options to the kernel which can compromise your system security. With a boot loader password in place, the password must first be entered before selecting any non-standard boot options. However, it is still possible for someone with physical access to the machine to boot from a diskette, CD-ROM, or USB media if the BIOS supports it. Security plans which include boot loader passwords should also address alternate boot methods. If you choose to use a boot loader password to enhance your system security, be sure to select the checkbox labeled Use a boot loader password. Once selected, enter a password and confirm it. When selecting a GRUB password, be aware that GRUB recognizes only the QWERTY keyboard layout, regardless of the keyboard actually attached to the system. If you use a keyboard with a significantly different layout, it might be more effective to memorize a pattern of keystrokes rather than the word that the pattern produces. To configure more advanced boot loader options, such as changing the drive order or passing options to the kernel, be sure Configure advanced boot loader options is selected before clicking Next. If you are installing Red Hat Enterprise Linux on a network device accessible through multiple paths, ensure that you select Configure advanced boot loader options before you click Next. The master boot record (MBR) — This is the recommended place to install a boot loader, unless the MBR already starts another operating system loader, such as System Commander. The MBR is a special area on your hard drive that is automatically loaded by your computer's BIOS, and is the earliest point at which the boot loader can take control of the boot process. If you install it in the MBR, when your machine boots, GRUB presents a boot prompt. You can then boot Red Hat Enterprise Linux or any other operating system that you have configured the boot loader to boot. The first sector of your boot partition — This is recommended if you are already using another boot loader on your system. In this case, your other boot loader takes control first. You can then configure that boot loader to start GRUB, which then boots Red Hat Enterprise Linux. If you have a RAID card, be aware that some BIOSes do not support booting from the RAID card. In cases such as these, the boot loader should not be installed on the MBR of the RAID array. Rather, the boot loader should be installed on the MBR of the same drive as the /boot/ partition was created. If your system only uses Red Hat Enterprise Linux, you should choose the MBR. Click the Change Drive Order button if you would like to rearrange the drive order or if your BIOS does not return the correct drive order. Changing the drive order may be useful if you have multiple SCSI adapters, or both SCSI and IDE adapters, and you want to boot from the SCSI device. The Force LBA32 (not normally required) option allows you to exceed the 1024 cylinder limit for the /boot/ partition. If you have a system which supports the LBA32 extension for booting operating systems above the 1024 cylinder limit, and you want to place your /boot/ partition above cylinder 1024, you should select this option. While partitioning your hard drive, keep in mind that the BIOS in some older systems cannot access more than the first 1024 cylinders on a hard drive. If this is the case, leave enough room for the /boot Linux partition on the first 1024 cylinders of your hard drive to boot Linux. The other Linux partitions can be after cylinder 1024. 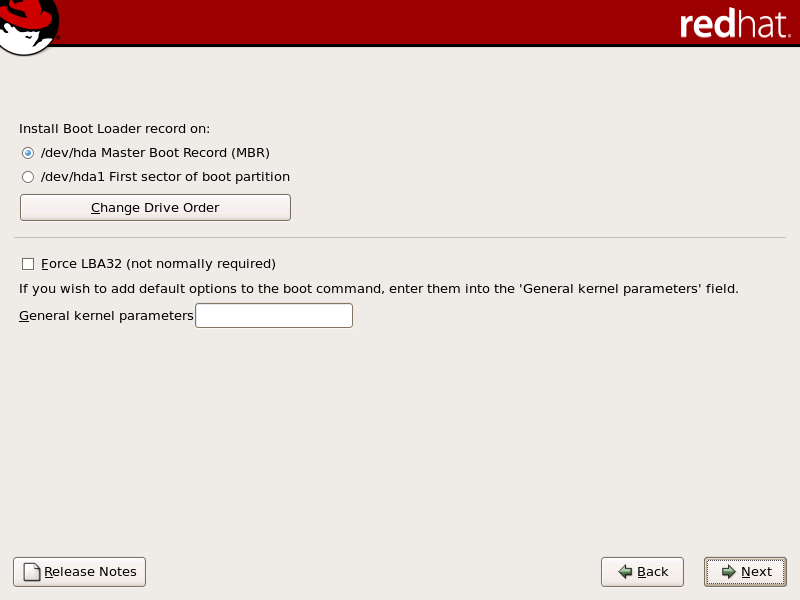 To add default options to the boot command, enter them into the Kernel parameters field. Any options you enter are passed to the Linux kernel every time it boots. If you are installing Red Hat Enterprise Linux on a network device accessible through multiple paths, ensure that GRUB is installed on the MBR of /dev/mapper/mpath0. Using the CD-ROM to boot an x86, AMD64, or Intel® 64 system, type linux rescue at the installation boot prompt. Itanium users should type elilo linux rescue to enter rescue mode. For additional information, see the Red Hat Enterprise Linux Deployment Guide. You can load Linux using commercial boot loaders. For example, System Commander and Partition Magic are able to boot Linux (but still require GRUB to be installed in your Linux root partition). 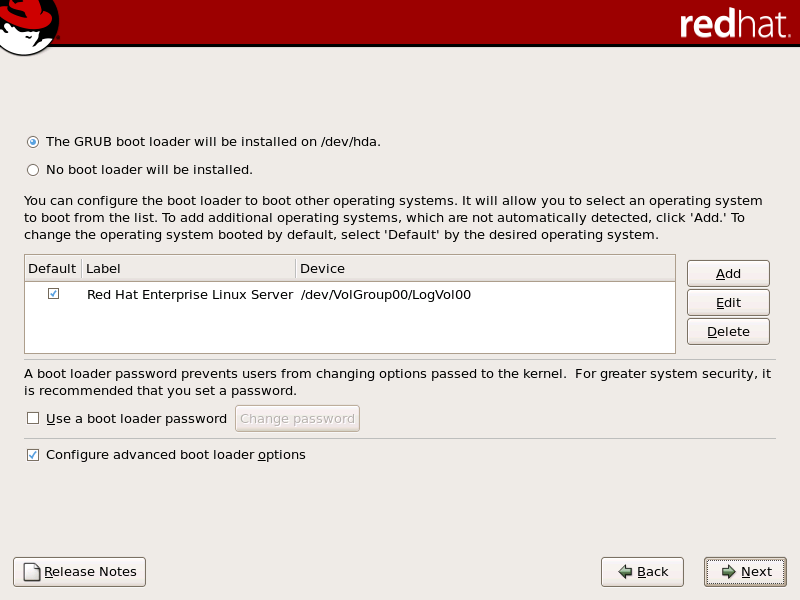 Boot loaders such as LOADLIN and System Commander are considered to be third-party boot loaders and are not supported by Red Hat. In previous versions of Red Hat Enterprise Linux there were two different kernel versions, a uniprocessor version and an SMP version. In Red Hat Enterprise Linux 5.11 the kernel is SMP-enabled by default and will take advantage of multiple core, hyperthreading, and multiple CPU capabilities when they are present. This same kernel can run on single CPUs with a single core and no hyperthreading.